Product stability is one of the top priorities during any IP phone evaluation. You will want to make sure your customers have a great communication experience without any interruptions or downtime. Check reviews or forums to see what other users are saying about the products you are interested in. Are there any software bugs or issues? How frequently do the issues happen? Have they been solved in a timely manner? There’s no 100% guaranteed, for perfect IP phone; so make sure you have a great technical support team to help you solve issues when needed. How does the manufacturer handle technical issues? Is there an easy way for you to contact the support team (via phone, email, webpage, etc.)? Do they offer 24/7 support? Last but not least, do your research on your customer base! Whether it’s the location of a button, touchscreens, or the size of the phone, you need to learn what your customers are looking for. The more you understand your customers, the better decision you will make. These are just some of the most important areas you will want to include in your evaluation process. If you’d like to have more detailed suggestions, contact our VoIP experts at 1-800-398-8647 today to get a free consultation to learn more! 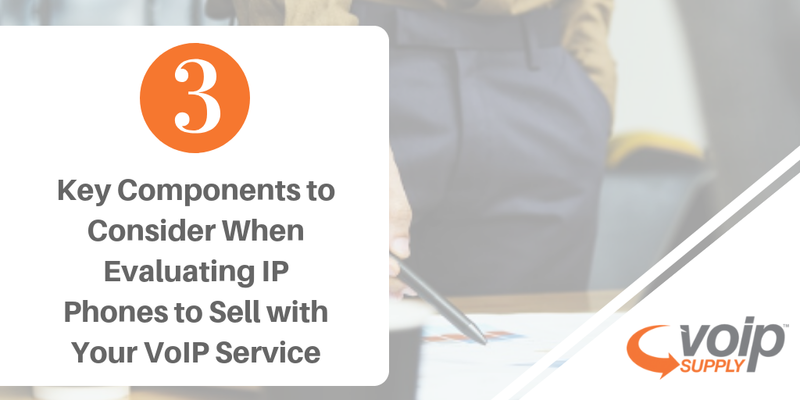 How did you select the ideal VoIP hardware to sell with your service? What was the process like? Utilize the comment box below to share with us!